Santa and Mrs. Claus rode atop an antique fire truck in the Bluffton Blaze of Lights Parade Saturday night. Sofia, Lillian and Angelina Seibert, from Spencerville, enjoy their first Bluffton Blaze of Lights. BLUFFTON — Around 100 units made their way down Main Street in Bluffton Saturday as part of the 32nd annual Bluffton Blaze of Lights Festival. The parade wound its way down Main Street from Snider Road to College Avenue, with marching bands, floats, horses and of course Santa. 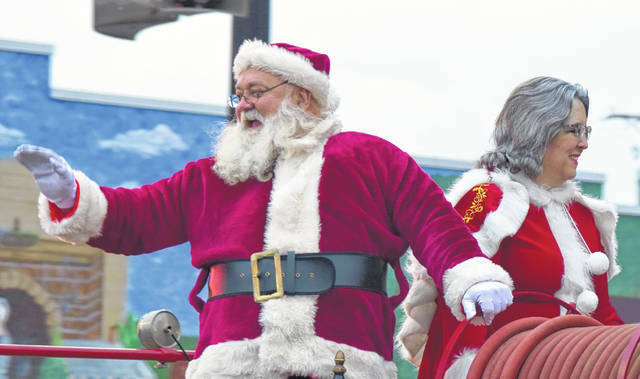 This year, Santa and Mrs. Claus were in the front of the parade, instead of one of the final entries, as they usually are. This gave the big guy in the red suit more time to meet with youngsters inside the Senior Citizens Center and find out what they want for Christmas. 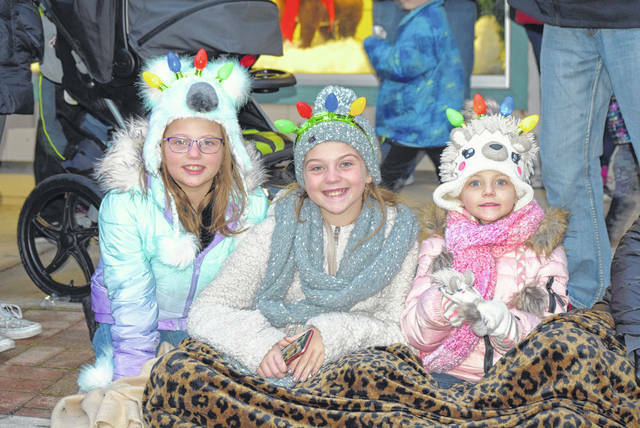 For Sharon Robey of Spencerville, it’s been a long time since she’s seen the Blaze of Lights, and this time she brought her three grand-daughters, Sofia, Lillian and Angelina Seibert who have never experienced the event. “I haven’t been here for a long, long time so we’re excited to give it our first go around, the lights and everything we’ve always wanted to but it seems like every time we had something else going on so this is a good year for us,” said Robey. Many downtown businesses stayed open extra hours, giving people a chance to shop local on Shop Small Saturday and enjoy the activities while going store to store. It took dozens of volunteers and the support of local businesses to make this Bluffton tradition come alive. “The whole village is pulling this festival together. I have 25 business sponsors that make it possible, provide funding for it. I have dozens and dozens of volunteers who are making it all possible. I have been talking with our downtown businesses. They are really going out of their way. I don’t think there’s a better day to come down and shop in Bluffton and eat in Bluffton. It’s an opportunity to have special things for people to eat and drink,” said Paula Scott, CEO of the Bluffton Area Chamber of Commerce. The parade, which started at 5 p.m., was led by grand marshals Billy Marchal and his wife Phyllis. They are the owners of the Bluffton Dari Freeze. At 6 p.m., The Bluffton High School Show Choir and Movement, an acoustic contemporary trio performed. Then at 7 p.m., the Ream folk art display, on the lawn of the Bluffton Presbyterian Church was lit. The display was started by farmer Harry Ream and his wife Dorothy in 1938. In the mid-1980s, the Ream family donated the 168 wood cutouts to the village. Artist Terry Mullenhour has added dozens more throughout the years. The “switch hitter” for this year’s lighting was Jane Wood, the new president of Bluffton University. The display was even brighter than in previous years with 1.42 miles of lights added, thanks to a grant from the Hancock County Convention and Visitors Bureau. The Ream display will remain lit through Dec. 31.